Get on the bus! As much a symbol of backpacker folklore as a means of transport, the humble bus is a staple of every South American journey. It’s from this vantage point that you’ll interact with local life, meet new friends and watch the continent unfold in full panoramic view. Most towns and cities have a central terminal, known variably as terminal de omnibus, terminal terrestre, or, in Brazil, rodoviária, from where all long-distance journeys depart. Others, especially in Peru and Ecuador, have multiple terminals serving individual transport companies. Make sure you know which terminal you need before you set out. It’s always advisable to have your ticket booked in advance, especially during busy seasons and around holidays. Services are usually severely restricted, if running at all, on national or religious holidays. This is where a specialist booking agency or travel pass company can come in handy. Quality (and safety, see below) varies wildly, based largely on how much you’re prepared to shell out. For a reasonable price you can expect a professional driver, a clean, well-serviced bus and confidence of reaching your destination on time. Of course you can always spend less but expect to get what you pay for. The best buses, coche cama or ‘bed bus,’ offer the most comfort for overnight trips, with fully reclining seats and often a hot meal served at your seat. Look for a lujo, or ‘luxury’ option, which often beats low-cost flights in terms of comfort. Sometimes the driver will play videos to alleviate the boredom, sometimes not, but the landscapes can be sufficiently picturesque as to take away some of the tedium. Bring clothing for all conditions. Climate in South America can change dramatically during a 20-hour bus ride, so you’ll want to have both warm and cold-weather clothes on hand to stay comfortable. Always keep some basic toiletries--toothbrush, toothpaste, toilet paper--in your carry-on bag. Earplugs are essential. Even better are headphones and your own entertainment. Bring a small lamp or flashlight to read at night. Bring snacks. Some bus companies don’t provide meals, and the dining options along the way are generally limited. Higher quality companies all provide meals. Booking ahead with an overland specialist can make all the difference. Above all, be patient. Breakdowns and mechanical problems are not uncommon, so don’t be in a rush to get where you’re going. Remember, it’s all part of the experience! With so many variables it’s virtually impossible to estimate an accurate budget. What you’ll pay depends on the standard of accommodation you choose--from fleapit hostels to luxurious Airbnb homes--how well you want to eat, and how much partying you like to do. Local prices vary wildly, too. Brazil, Chile and Uruguay are among the most expensive; Argentina is catching up after its historical currency slump; the Andean countries of Peru, Bolivia and Ecuador are traditionally more affordable, although prices continue to rise on the main gringo trail. A good way to plan your budget is to have as much booked and paid for in advance, including your accommodation, transport and big activities such as treks, a Galapagos side-trip, and any other major excursions. What you have left over is your pocket money: food, taxis and local transport, entertainment, souvenirs, etc. The difference you pay for accommodation in each country will give you a measure of how expensive they are relative to each other. Many hostels these days are inching up into the “flashpacker” market, with the dirt cheap but clean backpacker hostels virtually an endangered species. That said you’ll still find plenty of cheap accommodation, including dorm rooms. Keep your possessions safe and valuables in a locker. Couchsurfing and Airbnb are good options for finding bargains and something more locally flavoured. The USD is by far the best currency to travel with and will be readily converted to local currency everywhere you visit. The Euro and Sterling are also accepted, although not as universally. Keep your bills pristine; especially in Peru and Bolivia even the slightest tear can get them rejected. You’ll find an ATM virtually everywhere you go, aside from the very smallest towns. Ditto with currency exchange (cambio). In some countries (such as Peru) currency exchange in the street is considered safe and normal, less so in others. Get local advice from your hostel. South America is right at the top of the list for low-cost, independent adventures. For the thrill of a backpacking trip nothing beats Latin America and its blend of fascinating cultures, the thrilling cities and the outdoor adventures from mountains to rainforest to coast. For solo female travellers, concern is warranted. But with a few precautions, I managed to get span the continent on my own terms--and stay safe in the process. Just as in North America and Europe as anywhere else, pay attention to no-go zones. Each country and even each city has its good parts and its sketchy areas. In any city or town in South America, I would make it a point to steer clear of bus stations and transport hubs at very late-night or early-morning hours. It’s worth it to pay a little extra to avoid an odd-hours arrival or departure. There are obvious precautions that apply to everyone. Don’t find yourself alone, late at night in an unfamiliar part of town. Keep to brightly-lit, busy areas, even if it means taking the long way home or paying for a taxi ride. If you’re out drinking stick with people you know and trust, and don’t let your drinks out of sight. Use licensed taxis, and call to book ahead if possible. Couchsurfing can be an excellent way of skipping the hostel scene and getting a better insight into local life, but you do hear stories of over-amorous hosts picking up the wrong signals. Check their reviews and references carefully, including from other solo females. Finally, beware of the machismo. Men can be unreserved with their attention, whether it’s welcome or not. Usually this goes no further than prying eyes or the occasional whistle. This can be intensely annoying but the vast majority can be safely ignored. If attention becomes physical or too persistent for comfort don’t hold back in showing your anger and causing a scene--they’ll quickly back off. One area it pays (literally) to be extra cautious is with overnight buses. The higher-class buses (lujo) are both more comfortable and, in my opinion, more secure. It’s a good idea to get a money belt to stash your cash, and keep your valuables close at hand--not in the overhead bin or in the cargo hold. One technique I use is to hug my carry-on very close, then wrap a scarf or blanket around myself and the bag together before closing my eyes to fall asleep. That way, the goods are out of sight, and there’s an extra layer between them and sticky fingers. Knowing some local language can go a long way. Basic Spanish will help you out a lot, although keep in mind that it’s only Portuguese in Brazil and in remoter parts of the Andes, indigenous languages are more common than Spanish. But overall, I’d say if you’re okay with a bit of culture shock and can be adaptable to unfamiliar situations you’ll have a great time in South America. Generally speaking, border crossings in South America are straightforward affairs. You enter, the officials give you a visa stamp in your passport, and you’re good to go. Borders usually consist of two immigration checkpoints, with a stretch of no-man’s land in between. Usually the two checkpoints are within spitting distance, in which case you simply conduct the exit and entrance formalities, walking between the two and re-board your bus. Elsewhere the distance between the two checkpoints can be somewhat further and you’ll need transport to get from A to B. If you’re traveling on local transport, you’ll need to figure all this out for yourself. It’s usually smooth sailing--just follow everyone else. There will usually be touts and ‘helpers’ hanging around to point you in the right direction--for a fee! If you’re traveling with a half-decent transport company they’ll look after you and make sure you get where you need to be. That said, there are a few things worth keeping in mind to make the process as smooth as possible. Crossings may not be open round the clock, so check your arrival time. If you’re traveling by long-distance bus your trip will already be timed for any necessary border crossings. Be aware of time zone changes. Lots of people miss onward connections because they don't realise the time has gone forwards or backwards by an hour. If fees are applicable (entrance or exit fees, overstay fines, etc) you’ll need some cash. There should be an ATM there but don’t rely on it, plan ahead. Local currencies and US dollars are usually accepted. Small change is handy--bigger bills can be hard to break. Not all border crossings are created equal. Some are calm and orderly, others are chaotic and lawless. Do some research on your crossing before you arrive so you know what to expect. They’re busy places so keep an extra vigilant eye on your belongings in all the hustle and bustle. This isn’t the right time to pull out your expensive camera and start snapping photos. Be watchful and avoid offers for help from non-officials. Reciprocity fees are notoriously fickle, changing often and without notice. For that reason we haven’t listed the current fees. Be sure to check ahead before you reach the border. Argentina charges visitors from Canada, Australia, and, until recently, the U.S. a fee to enter. This fee must be paid online before you enter the country; it cannot be paid at the border. On March 24, 2016, the fee was suspended for 90 days for U.S. citizens, but it’s still not known how things will be in the future. Check the embassy’s webpage before you go. Americans need to pay a reciprocity fee, in U.S. dollars, upon entering. You’ll also need a passport-sized photo for the visa. Australians have to pay a reciprocity fee in Chile, but only if arriving by air. This doesn’t apply to land borders. The diversity of South America’s geography and climate is all part of the appeal. With overland trips ranging through coastal deserts, over the Andes and into tropical jungle, it comes as little surprise to find the weather, well... changeable. There are also some major events and pronounced peak and off-seasons to be aware of and, if possible, time your trip around. Machu Picchu, including the Inca Trail and trekking more generally in the Andes, is more pleasant during the dry season from May to October. Trails are firmer underfoot and there is less risk of disruption from heavy downpours. That said, it’s perfectly fine to spend time in the Andes year round, just be prepared for rain. The wettest months are January and February, and note that the Inca Trail is closed for maintenance every February. If you are planning on hiking the Inca Trail you’ll need to book your permits well in advance (at least two or three months). South America’s most popular tourist destination is consistently busy no matter the time of year, but particularly so during the northern hemisphere’s summer vacation season (July and August). The best period to beat the crowds are the shoulder seasons in October and April, when the weather is still generally good. Rio is a subtropical city, which means hot and humid summers. Highs of 37 C (100 F) are not unheard of and humidity levels hover around 80 or 90 percent. This is also rainy season, so cloudbursts are frequent but generally short lived. If you’re not hellbent on going to Carnival and want to avoid these sticky conditions, consider going in the autumn (March to May) or spring (September and October). These are also, happily, the times when the tourist crowds are at their lowest. If you’re headed to Ilha Grande, climate conditions there are generally similar to Rio. If you’re timing your trip to coincide with the world’s greatest party, be sure to plan well ahead. Although Carnival is theoretically just five days long, the revelry dominates Rio for most of February. Get your accommodation and Sambadrome tickets booked in advance to avoid scalpers and touts. As part of the Bolivian altiplano, Uyuni has a remarkably consistent climate. Daytime temperatures are about 15 C (60 F) year-round--dropping towards zero at night. If you want to see the flats when they’re wet, go during March or April; otherwise, for the best climate, July to October is ideal. Patagonia covers a vast area and conditions vary considerably. Generally, though, in the north, the temperatures vary from around zero C in July, up to 20 C and above in January. The warmer months are the most comfortable, but whenever you go, be prepared for the strong winds that whip across the plains year-round. Iguazú is located in a tropical zone, which means that during the summer months (December to March), the heat and humidity can be overpowering. Compounding the problem is the possibility of flooding, which has been known to inundate some of the area’s walks. Factor in the crowds in January and February, when most Argentines and Brazilians take their vacations. One good option is the shoulder months of May and September, when skies are still generally sunny and the crowds are manageable. But the winter months (June to August) are also a possibility, if you don’t mind overcast skies and occasional rain. Due to the Atacama Desert’s unique location and geography, the climate rarely changes; the rule is sunny skies and zero humidity year round. It is surprisingly cool for a desert; maximum daytime temperatures run from around 20 C (70 F) in the winter to 26 C (80 F) and higher in the summer. At night, these numbers drop dramatically so you’ll want to bring some warmer clothes if you plan on making a nocturnal excursion. What visas are required for South America? Most South American countries allow tourists 90 days visa-free but specific requirements do vary by nationality. A good resource can be found at: https://www.visahq.com/citizens. Keep in mind that some countries apply reciprocity fees for certain nationalities. Will I need an onward ticket to enter each country? When you check in for your flight to South America you may be asked for evidence of onward travel. It’s worth having a ticket (either bus or flight) booked in advance. What vaccinations are needed for South America? Aside from the standard travel vaccinations (Hepatitis A, Tetanus and Typhoid), you may also want to consider vaccinations for Hepatitis B and rabies. Yellow Fever is a must-have, and some countries require it if you’re travelling to places where it occurs. What about malaria, dengue, zika and chikungunya? You cannot be vaccinated against these illnesses. Taking a course of antimalarials may be wise if you’re planning on spending time in a high-risk area, but be aware of potential side effects. With mosquito-borne disease, prevention is by far the best medicine. Bring a mosquito net, keep your arms and legs covered, and use a good insect repellant. 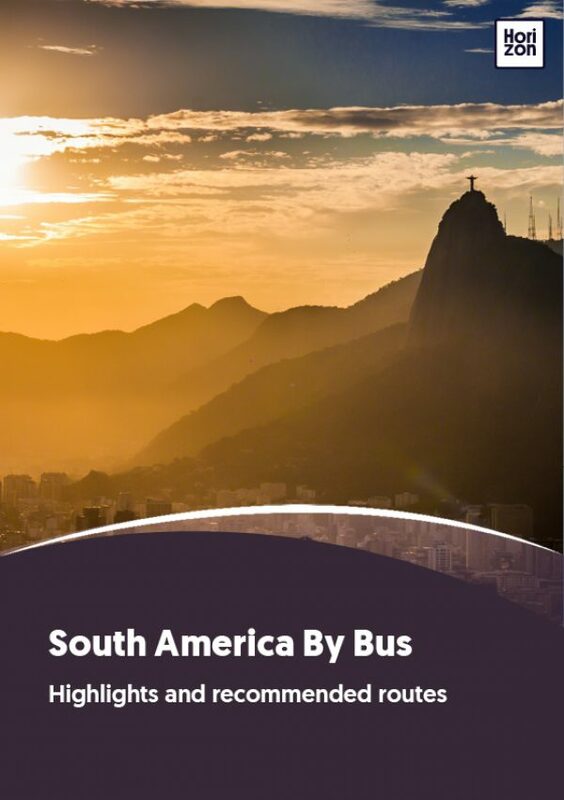 Is bus travel safe in South America? Yes, but take sensible precautions. Keep valuables with you in the cabin, not in your big backpack which will be stowed out of sight under the bus. Don’t leave your day bag in the overhead storage, just keep it between your legs and looped to one leg. How do I get to and from the bus terminals? Taxis in South America are cheap and reliable and will zip you to and from the bus terminals at any time of day. When arriving to a destination it’s always a good idea to have your accommodation pre-booked and the address written down to show the driver. If the taxi doesn’t have a meter make sure you agree a price before getting in. On your way back out to the terminal ask at your hostel reception to call a registered taxi.